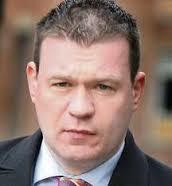 ‘Clean green status of Ireland’s agricultural industry seriously undermined’, says farm leader. 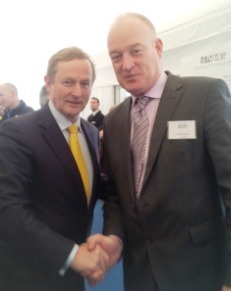 Patrick Kent, President of the Irish Cattle & Sheep Farmers’ Association pictured with the Taoiseach, Enda Kenny. A government decision effectively blocking Ireland being registered as a GMO free zone has caused uproar in farming circles. Under new legislation, introduced in April, individual EU member states were given until early October to apply for the right to ban GM crops deemed to pose a risk to human health or the environment. However, it has now emerged that Ireland is among a small number of countries that has refused or failed to register by the October 3 deadline. The government decision, interpreted by many as a move designed to clear the way for the cultivation of GMO or transgenic crops in Ireland, has been attacked as highly threatening to the future of the country’s agricultural industry. Leader of the powerful Irish Cattle and Sheep Farmers Association, Patrick Kent said Ireland’s “clean green status has been seriously undermined” by the government’s decision. More than half of the EU member states, including Germany, France, Italy, Austria, Greece, Hungary, Latvia, Lithuania and Poland, have opted to take advantage of the new EU law to ban cultivation of GMO crops within their borders. Northern Ireland, Scotland, and Wales are among regions that have also decided to do so. Questioning why Ireland had “opted to go the other way”, the ICFSA president said the stance taken by the government afforded “no commercial advantage to farmers. Genetically modified foods or GM foods, also genetically engineered foods, or what some have termed ‘Frankenstein foods’, are foods produced from organisms – bacteria, viruses, viroids and animal and plant cells – that have had changes introduced into their DNA using the laboratory methods of genetic engineering. 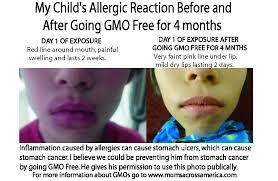 Cultivation and sale of GMO produce is opposed by farmers and consumers across the world, most notably in Europe. Monsanto, a publicly traded American multinational agrochemical and agricultural biotechnology corporation, headquartered in Creve Coeur, Greater St. Louis, Missouri, is the world’s leading producer of genetically engineered seed.